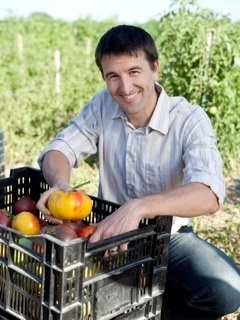 They connect organic farmers and good food producers with consumers in large cities and urban areas. Good question. Their CEO is Chad Arnold (shown under) but while they appear to have a great reputation online I cannot find a mention anywhere of the founder(s) names. A shy bunch. On the same page they list 30 standards which they use to filter their producers. I love these schemes. In 1990 we were the first Wolverhampton hub for Organic Roundabout, a Community Supported Agriculture business out of Birmingham. In 1995 in Waterford we received a weekly box from a local organic farmer and when we moved to Kilkenny in 1997 we sourced another local organic box delivering farmer and we have been with him since. As with many other alternatives to the traditional distribution system this is not the full solution but it is a strong part of it. Giving you a chance to talk directly to farmer producers, to appreciate the work and challenges, to share their passions and to eat seasonal, organic produced food. This post was prompted by a US$2M investment into the business by a Colorado based VC who focus on sustainable and healthy lifestyle opportunities.